Are you going to do a deliberate selfing too to see if the rugose foliage can be brought back out? I don't think so, because I don't particularly like typical Rugosa foliage. I'm much more inclined to mate it with some of my Foliolosa hybrids because I love their fern like leaves. Therese Bugnet might get thrown into the mix as well for the same reason. Nice color saturation bloom size and glossy leaves. The breeding is complex and promising. What would you like to improve in it? This hybrid tends to bloom one flower to a stem. That is a trait I would like to fix. This needs to bloom in clusters to perform as I'd like. Bloom color could stand to be improved some as well; it reads as a plain old pink by day two. Love the shiny dark green foliage; reminds me of old ivy leaves. The foliage of this seedling is particularly fine. It has "Linda Campbell-esque" qualities that betray its Rugosa heritage, but you'd have to know its pedigree to really glean this fact. 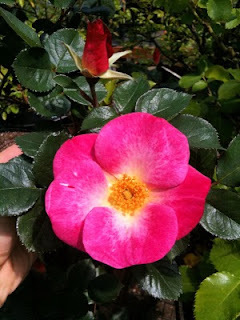 I'm hoping that by back-crossing it to "Magseed" again it might pick up more Rugosa qualities while retaining superior vigor and rebloom qualities. The purebred Rugosas are beautiful, but their rebloom leaves a lot to be desired, IMO.